on the 2019 Database in January & February. 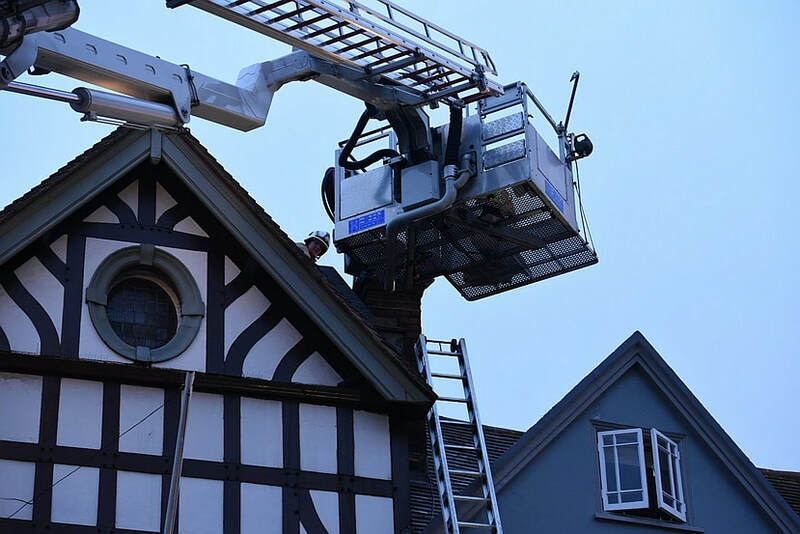 Our January Newsletter is out now with articles on all things related to fires, fire prevention, protection and restoration of heritage buildings - See this and our previous Newsletters HERE. "Our Heritage Under Fire" brings interesting, informative and enlightening news and comment for everyone who has an interest in the protection of the UKs built heritage. Subscribe by clicking the button below to be added to our mailing list. Don't miss an issue. 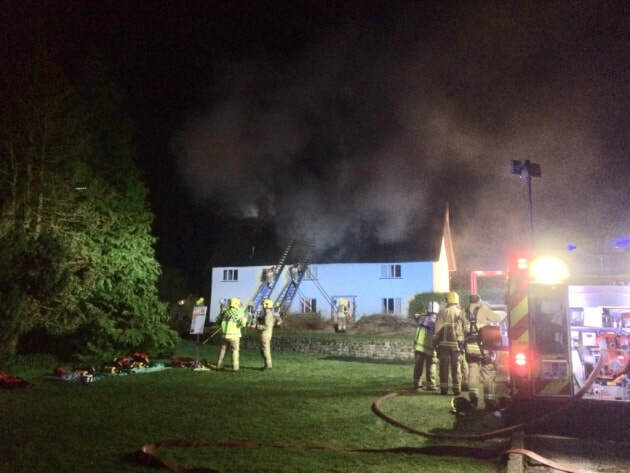 More than 70 firefighters tackled a blaze at a home in Cranborne yesterday evening. 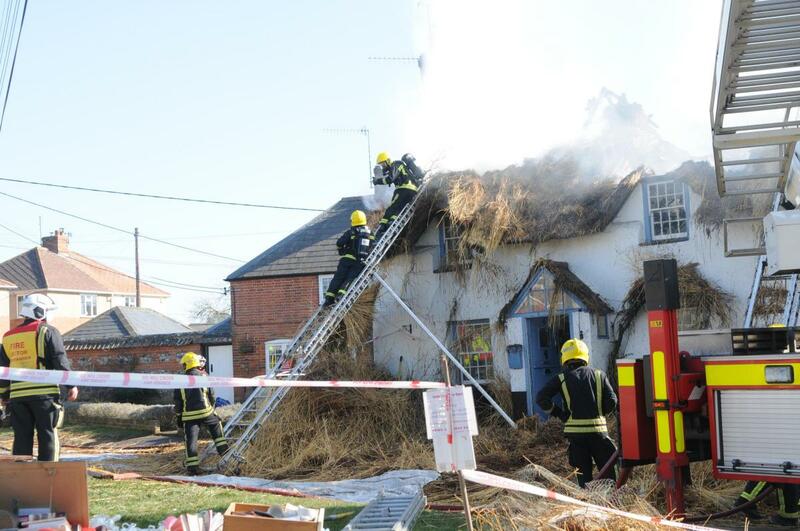 The fire has affected a thatched cottage in Church Street. 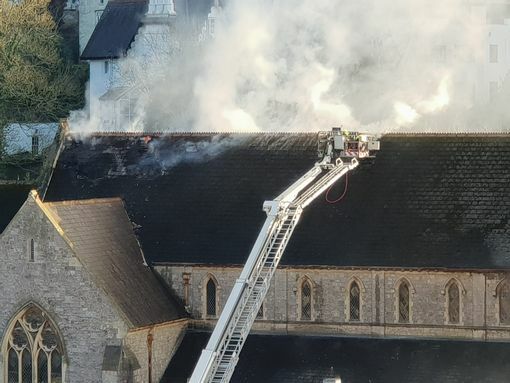 Ten fire engines were called to the scene and 75 firefighters worked in "demanding conditions" to get the blaze under control, according to a Dorset and Wiltshire Fire Control spokesperson. The B3078 was closed through the village while crews deal with the incident. The fire service was called at around 6pm. Residents were asked to stay indoors and keep windows and doors closed due to smoke. People were urged to avoid the area due to the number of fire engines in attendance. 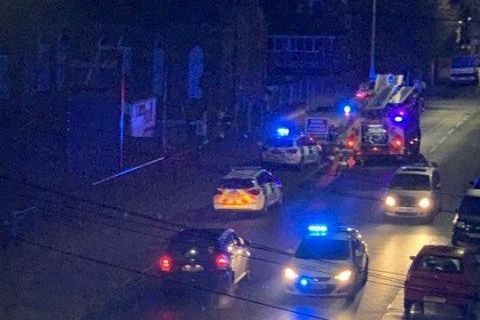 Half an hour after fire crews were called to the incident, a single-vehicle crash was reported in Castle Street in Cranborne. Firefighters made sure nobody was trapped in the vehicle. A male casualty was taken to hospital. Shortly before 10pm, the fire service said crews would be "scaling down attendance in the next hour. 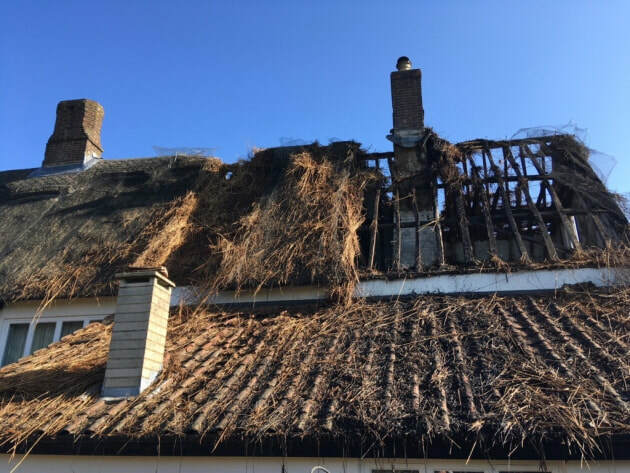 Despite damage to thatched roof, firefighters successfully avoided significant fire damage to the rest of the property and worked hard to salvage all of the owners' possessions," the service said in a tweet. The two semi-detached thatched cottages on Church Street were once a single house. It is Grade II listed and dates back to the 15th century when it was probably an open hall. As with any building this old, it has undergone alterations through the centuries but still retained many of its original features. 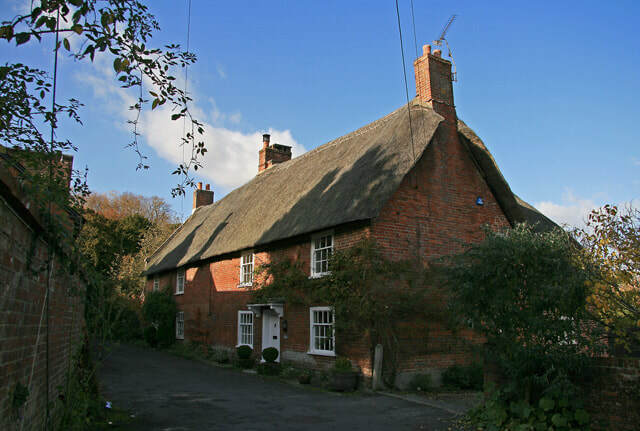 The cottage lies within Cranborne Conservation Area. A total of 20 fire engines are in attendance at the blaze near Netheravon. The thatch fire was reported to emergency services at 9.18am this morning (Tuesday February 26th). 15 appliances from Dorset and Wiltshire Fire and Rescue and a further 5 from Hampshire are dealing with it at the moment. Around 100 firefighters are currently on the scene. Luckily, it's not believed that anyone's been hurt. The severity of the blaze means some road closures have had to be put in place. Wiltshire Police tell us that the High Street in Haxton is closed, between the Mill Road and Lower Street junctions. The closure's been put in place due to the large number of vehicles in the area. 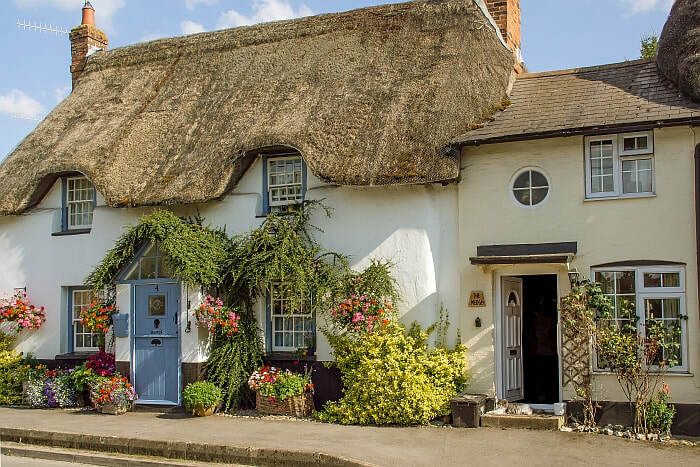 The house is known as Magpies Cottage and was built in the late 18th century. It is Grade II listed and lies within the Fittleton & Haxton Conservation Area. There is serious damage to the cottage roof. 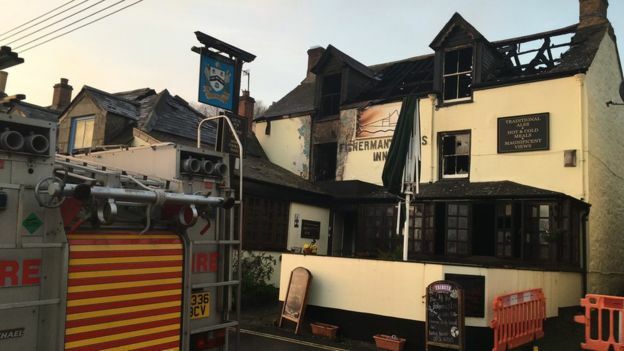 The loss of an historic pub in Newlyn from a fire in the early hours has shocked the close-knit community. 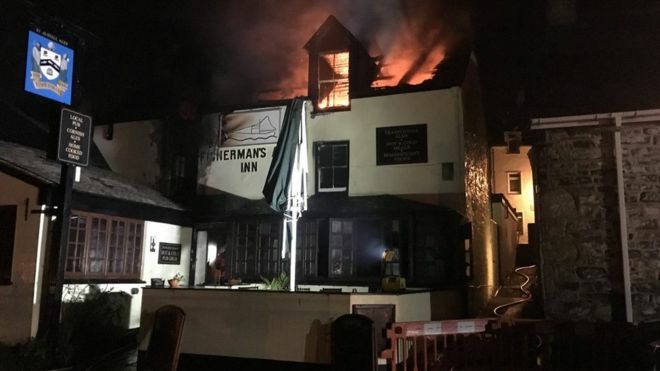 Fire has gutted the Fisherman’s Arms Inn on Cliff Road. Witnesses reported seeing flames leaping from the roof during the blaze in the early hours of Monday morning. There was immediate concern for the owners, Sally and Dave Reed, who were taken to hospital following the blaze as a precaution after breathing in smoke. At 12.48am Cornwall Fire and Rescue Service Critical Control Centre received numerous calls reporting a fire in a property in Fore Street. Appliances from Penzance, St Just, St Ives, Tolvaddon, Hayle, Truro and Helston, along with officers and support vehicles were in attendance. A neighbouring house lost roof tiles and suffered water damage. Devon and Cornwall Police said that a number of nearby properties "were evacuated as a precaution" and roads remain closed in the area. The Fishermans Arms Inn is a 17th. Century building which was (and probably still is) the haunt of the Newlyn fishermen).It lies within the Newlyn Conservation Area. 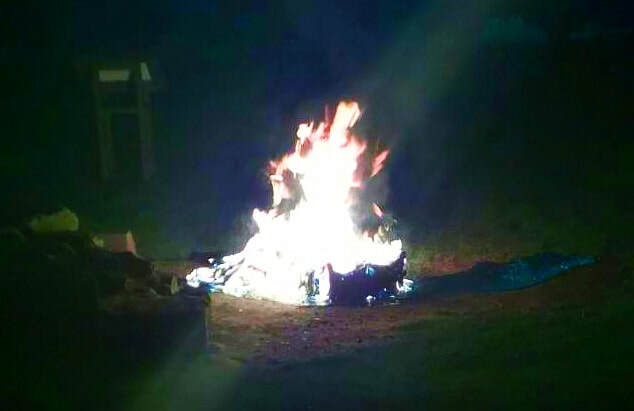 A concert had to be stopped after a blue bin was burnt out by youths in Kilwinning’s Abbey church grounds. A winter concert by the Ayr String Band on Sunday night was interrupted just 10 minutes in after the incident on Sunday evening [February 24] just after 9pm. This follows recent complaints at the town's community council of burning bins and damage to the war memorial in the Abbey. Kilwinning Community Council Secretary Nairn McDonald said: "It's really upsetting to have to pause the concert due to wheelie bins being set ablaze in the Abbey Ground. This is not only criminal vandalism but it is incredibly dangerous and deeply disrespectful. It's clearly a small minority who are doing this but people in the community must know who they are so they need to be active and report it to police. People clearly know who they are because they'll be going home stinking of the fumes and there's not much the police can do if they don't know who that is. Not only is it disgusting and disrespectful to be doing that in a historic church ground but also it's a graveyard, people are buried in there, it's the height of disrespect." This follows similar acts of vandalism raised with police at the meeting of Kilwinning Community Council last week. Community Councillor Janey Grier said: "There was at least one blue bin set on fire in the Abbey grounds on Friday (February 15) it was absolutely dreadful. It was just burnt out and the contents of it had been burnt out in the Abbey as well it was really shocking." Community Councillor Jim Watson said: "I walked through the Abbey grounds today (Thursday, February 21) and someone has been trying to damage the base of the war memorial by throwing stones where the names are on it, it’s really quite disturbing to see that. It’s very disrespectful. Again it’s dark, it’s a very difficult area to police but I find it very disturbing that people would be so disrespectful." Police have confirmed they have been speaking to Kilwinning Community Council regarding the vandalism incidents. Anyone with information should call Police on 101. 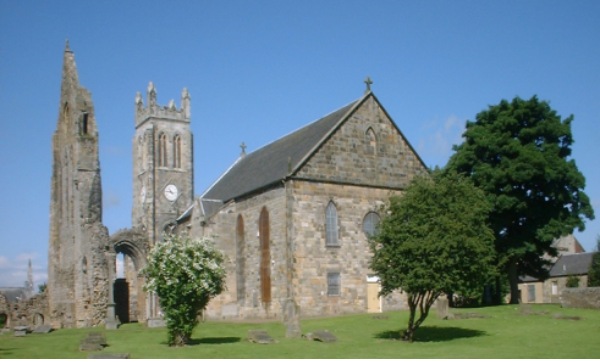 The Parish Church of Kilwinning is Category B listed was built by John Garland and John Wright and completed in 1774. It stands on the site of an earlier sixteenth century church which in turn was located within the ruins of Kilwinning Abbey. The Abbey was founded in 1188. Many stones from the old Abbey were re-used, and these are easily seen by the uneven surface of some of the outer walls. It therefore has a history that goes back over 800 years on this site. However there is also a connection with the Celtic church which takes it back over 1400 years. The congregation is now known as Kilwinning Old Parish Church of Scotland. The church building still tends to be known as the Abbey Church. There is also a Category B listed detached Gothic Revival church tower erected in 1815 on the site of a mediaeval one. The Abbey ruins are Category A listed and also a Scheduled Ancient Monument. 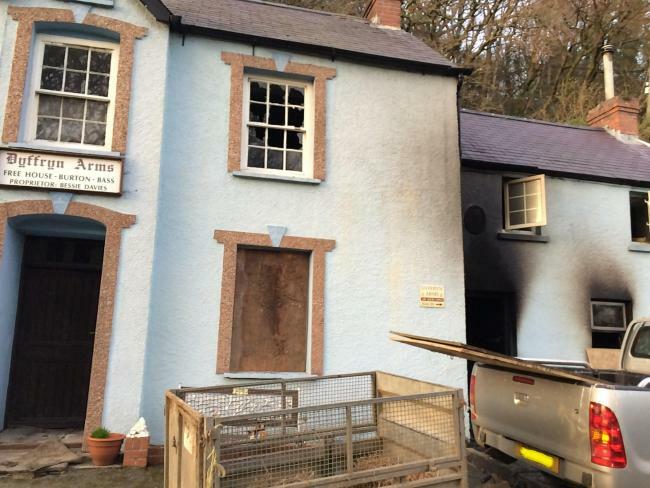 24 February 2019 (12:05) - A blaze has caused significant damage at a famous north Pembrokeshire pub. Fire crews from Haverfordwest and Fishguard were called to the Dyffryn Arms, known locally as ‘Bessie’s’ in Cwm Gwaun this afternoon (Sunday). 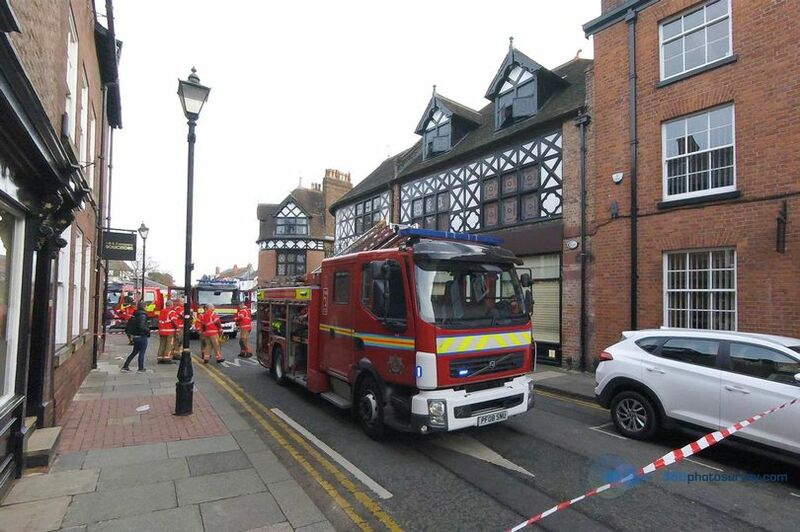 Significant interior damage has been reported in the bar and living areas of the Grade II listed two-storey pub, and the road was closed while the emergency crews dealt with the incident. Firefighters arrived at the scene at 12.05pm and used hose-reel jets, breathing apparatus and thermal imaging cameras to tackle the blaze. It was listed for its special architectural and historic interest as a very rare survival of a rural pub in a mid C19 building of late Georgian pattern, typical of this period and retaining good historical detailing. It represents a once common building type across the British Isles that has now been almost completely lost. Location: In the centre of the hamlet of Pontfaen, near to the Picton Mill Bridge. 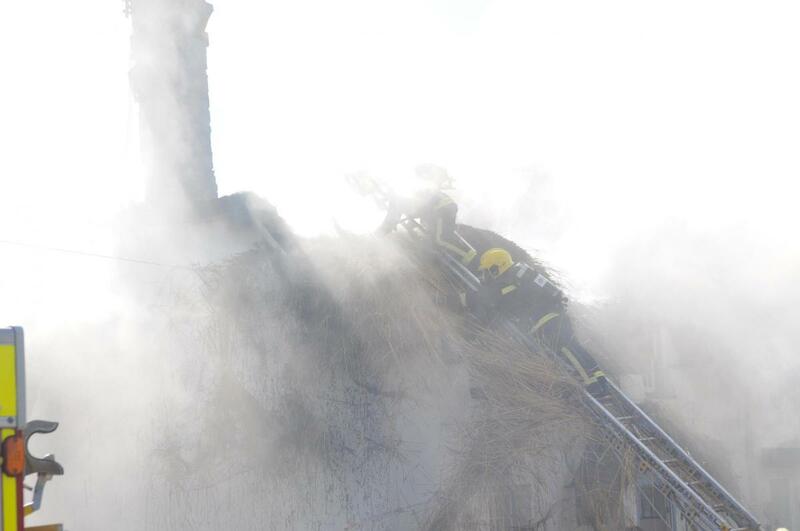 Firefighters are tackling a fire in Cambridge city centre (February 24). Part of the Market square has been cordoned off while fire crews work to extinguish the blaze near Franco Manca. Photos from the incident show two fire engines in attendance, they appear to be tackling a fire just outside of the popular pizza restaurant. There are road closures in and around the market square. Those out and about in Cambridge this afternoon are being asked to avoid the area if possible. A spokeswoman for Cambridgeshire fire and rescue said: “Crews are currently tackling a fire in Cambridge city centre. 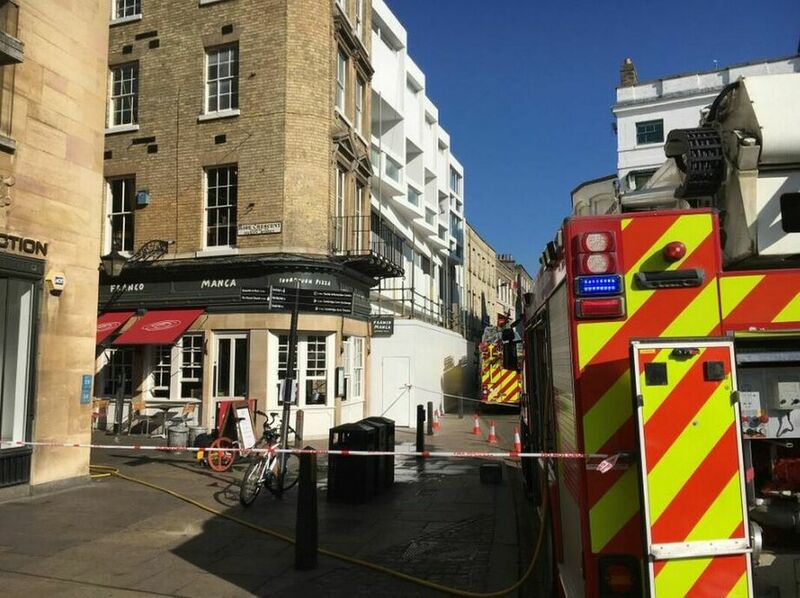 It was first reported to us at 10.55am and it was reports of smoke coming from the roof of Franco Manca.” Two crews were still dealing with the fire at 2.30pm. Market square re-opened just after 5pm. 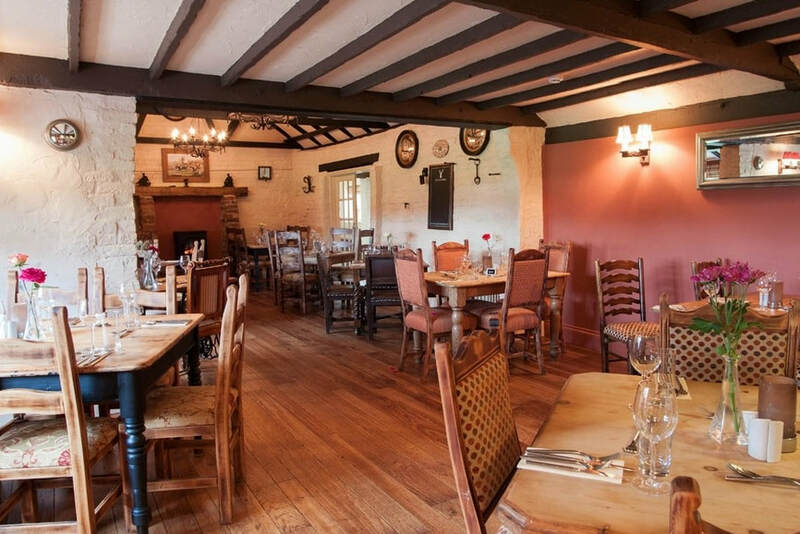 The restaurant occupies a Grade II listed building, built in about 1840 as a house and shop. It lies within the Central Conservation Area. Part of the historic Dunston Staiths has been severely damaged in a fire which broke out overnight. Three fire engines and the fire boat were called out to a blaze on the timber jetty on the Tyne at around 10.45pm on Saturday. A total of 17 firefighters were at the scene as the fire took hold on the lower and upper level. Ten timber structural beams on the 126-year-old structure were also damaged by the fire, which was extinguished using a jet. Volunteers who have helped restore the site have reacted with fury. 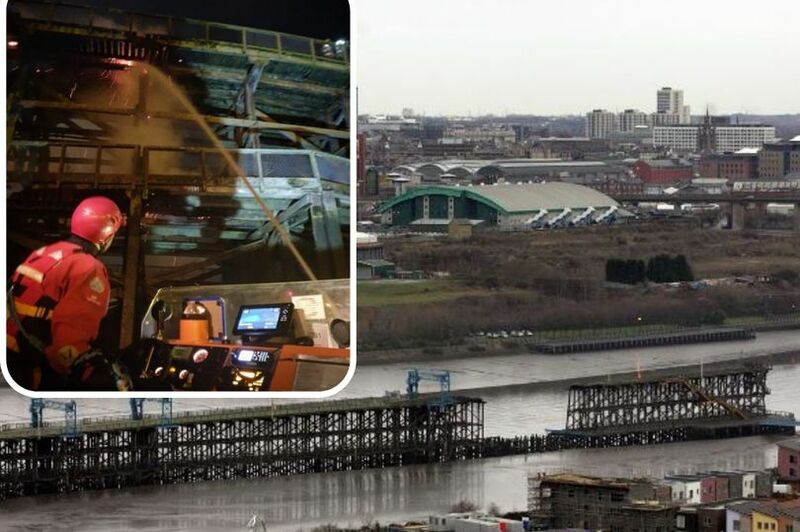 A crew from Byker station posted on Twitter: "Our fire boat was called into action tonight to help crews from Newcastle and Gateshead extinguish a large fire on the Dunston Staiths. We were also there for safety as there were firefighters working above the water, high up on the staiths." The Grade II listed structure was built in 1893 by the North East Railway Company to allow large quantities of coal arriving by rail from the Durham Coalfields to be loaded directly onto waiting colliers (coal ships). The 520m (1,709ft)-long structure, believed to be the largest of its kind in Europe, played a crucial role in the transportation of millions of tons of North East coal from the Tyne. The 1920s saw 140,000 tons of coal a week loaded at Dunston - the last working staiths on the Tyne - but by the 1970s, this had fallen to just 3,000 tons. In 1980, the staiths loaded its final shipment and was closed. In 1990 the listed structure was rebuilt as a tourist attraction at the National Garden Festival. Labour councillor for Dunston and Teams, Brenda Clelland, said: "I'm devastated and appalled at what has happened. Someone has been absolutely determined to do this, you would have to work really hard to get that type of wood to catch fire. It's happened before but it's truly shocking." Andrew Smith is a member of the Friends of the Dunston Staiths volunteer group. He said: "It's a very important part of our region's history and has protected status. It's already on the 'at risk' list because of its age and somewhere around £400,000 has been spent restoring it in recent years. This sort of vandalism is immensely frustrating and very disheartening. We're going to have to look again at security and installing cameras to protect it." It's not the first time a fire has broken out at Dunston Staiths. A blaze partially destroyed it in 2003 and it was hit again in 2010 by another suspected arson attack. It is not currently known if a fire investigation will take place. A heartbroken family who watched a fire rip through the roof of their farmhouse say it no longer feels like home. 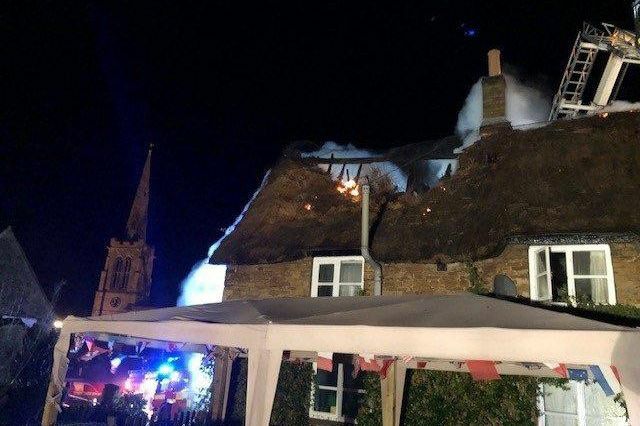 About 60 firefighters battled the thatch blaze at the Grade II listed White House Farmhouse in Bergh Apton Road, Mundham, on Saturday night, with fire crews remaining on scene until 1.50am. 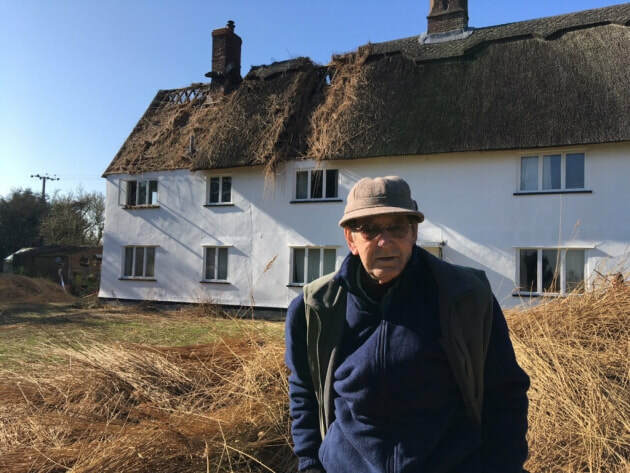 Richard Key, 76, who has lived at the farmhouse with his wife Margaret for 55 years, said he was devastated by the fire. Firefighters tackled a blaze at a B&B in Bewsey in the early hours of this morning. 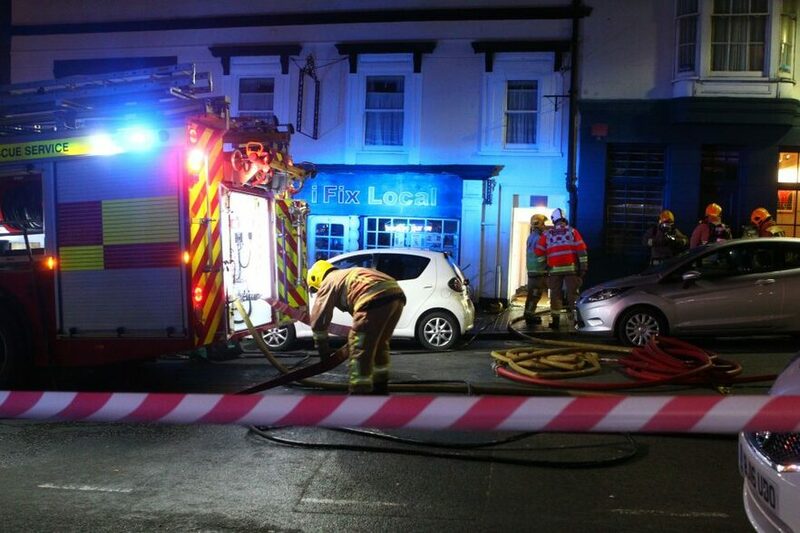 Five fire engines were called to the Holly Lodge Guest House on Froghall Lane shortly before 2.30am today, Saturday. A fire had been started in the basement of the property, but all persons inside the hotel were accounted for. Holly Lodge is a detached Grade II listed red brick Victorian Gothic villa. The fire at Holly Lodge started in the cellar. Fire crews were called to an incident at a Somerset hotel in the early hours of this morning (23rd) after an unattended candle ignited a picture frame and artificial flowers. 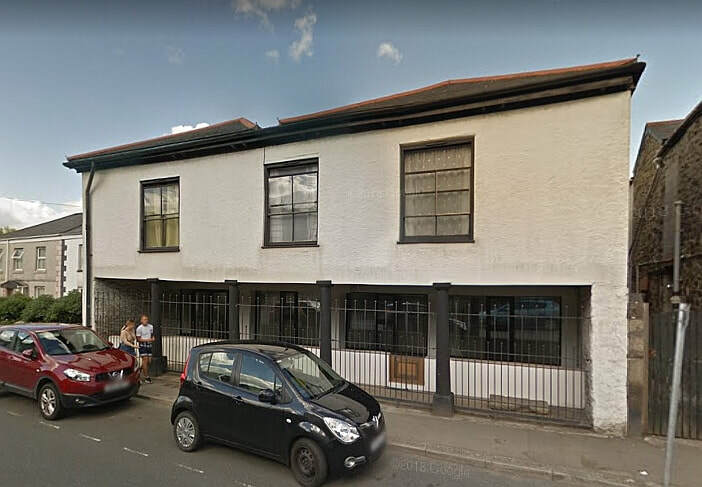 Engines from Cheddar and Burnham-on-Sea were sent to The Oak House Hotel in Axbridge at around 1:30am after receiving a call from someone within the property. Upon arrival crews found that most of the fire had already been put out by a passer-by who, when he heard the alarm, entered the hotel and used an extinguisher. The remaining fire, located in the bar area, was quickly dealt with by crews. The cause of the fire was accidental, a spokesperson for Devon & Somerset Fire & Rescue Service confirmed. 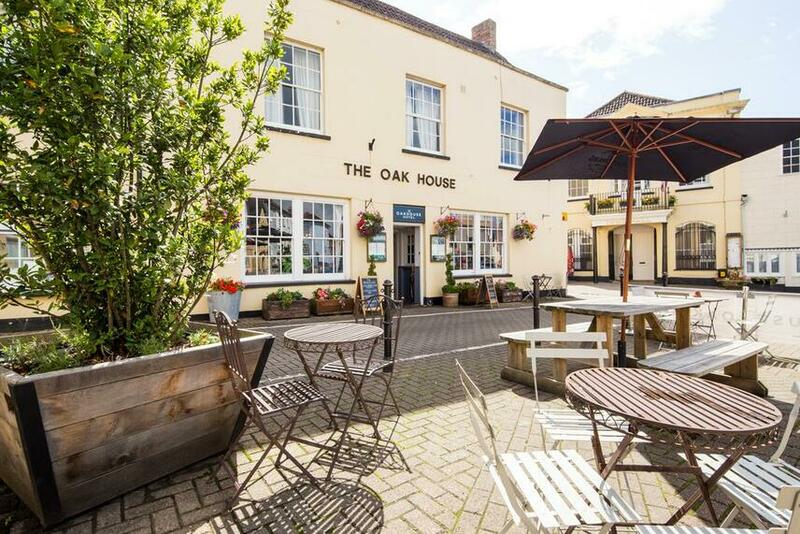 The Oakhouse hotel is a Grade II listed late 18th century building that sits in the medieval market square in the town of Axbridge. Parts of the hotel date back to the 11th century and original features include an ancient well and a large inglenook fireplace. It was originally two separate houses. It lies within the Axbridge Conservation Area. 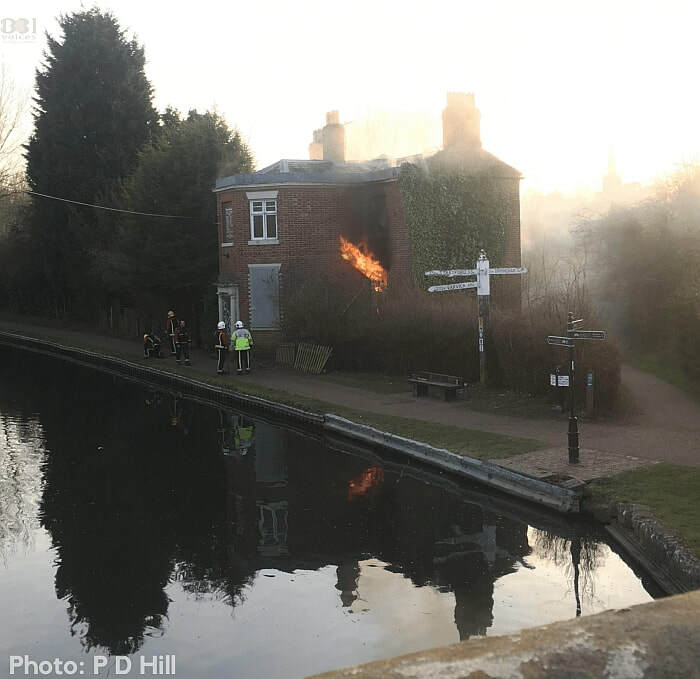 Four fire crews from West Midlands Fire Service faced a difficult task yesterday (Friday 22nd February) as a fire tore through an historic Grade II listed landmark canalside building in Kings Norton. A response vehicle was able to get to the scene but fire trucks were unable to get close, meaning 20 firefighters had to carry equipment to the location and pump water from the canal to tackle the blaze. Firefighters wearing breathing apparatus searched the building as there was concern rough sleepers may have been using the property. Two crews remained on scene overnight as a precaution but the scene was cleared by the fire service this morning. It is understood that the building is owned by the Canal and River Trust and they have been contacted for comment. West Midlands Police confirmed that they are investigating the incident as arson. Firefighters tackled a blaze at a flat above a shop in Altrincham. Market Street, in the town centre, was sealed off in both directions while crews attended. Firefighters were called to reports of the blaze at 9.30am this morning. They used four breathing apparatus and two hose reels to bring it under control. It was extinguished at around 11.15am, but crews remained at the scene to carry out clean up operations. A spokesman for the fire service said there were no reports of any injuries. The fire was in a building that covers 1, 1a and 3 Market Street and 2 Post Office Street and it is Grade II listed. The whole of Market Street lies within the Old Market Place Conservation Area. It was originally built as Morrison's Central Auction Galleries, in the 1890's for Sir William Cunliffe Brooks. 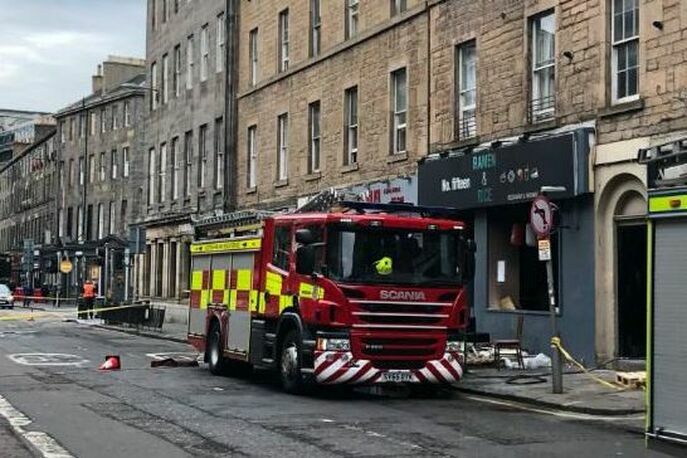 e Motorists have been facing disruption this morning after a fire broke out at a takeaway in Edinburgh’s Old Town more than six hours ago. 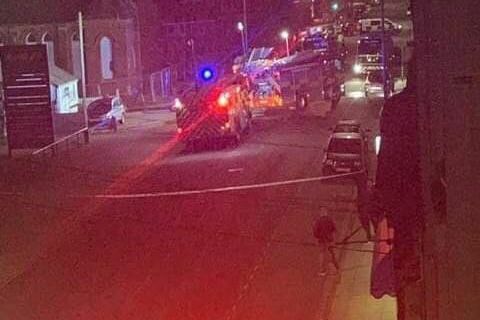 About 40 firefighters have been involved in battling the blaze at the Ramen and Rice takeaway in Bread Street, after being alerted just before 3:20am. At its height, six fire engines and a height appliance were used to tackle the flames but this has now been scaled back to two engines. A fires service spokeswoman said that firefighters are now checking for any remaining hotspots. No one has been hurt as a result of the fire, the cause of which is unknown at this stage. Equipment from the restaurant was brought out onto the street by firefighters. At around 7am, the fire had been largely extinguished and crews were working to dampen down the building. The building lies within the West End Conservation Area and within the Edinburgh World Heritage Site. It is part of a row of terraced buildings that are Category C listed as a group. They were designed by William Burn, circa 1820, for the Merchant Company's Grindlay Estate. 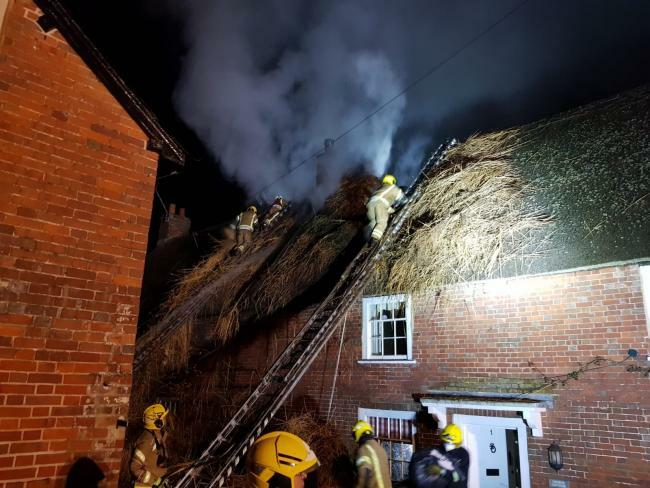 Crews of firefighters were called to a thatched cottage in Acreman Street, Cerne Abbas following reports of a chimney fire. Dorset and Wiltshire Fire and Rescue Service was alerted to the incident at 8.12pm yesterday, (21st). Crews from Dorchester, Maiden Newton, Yeovil and an Aerial appliance from Yeovil were sent to the scene. A fire that tore through a flat in mid Cornwall scrambled crews from St Austell, Lostwithiel and Truro. The blaze broke out on the first floor at St Blazey on Tuesday lunchtime, and spread to the roof. It happened on Fore Street and Pirate FM understands everyone made it out of the building safely. Crews, wearing breathing kit, used hoses and jets managed to stop the flames from spreading further. A statement from Cornwall Fire and Rescue Service said: “Two pumps from St Austell community fire station, one pump from Lostwithiel, the Aerial Ladder Platform from Truro and two Wholetime officers were mobilised to a fire in a first floor flat and roof space in St Blazey. Crews used six sets of breathing apparatus, two thermal image cameras, two hosereels, one safety jet and one covering jet to extinguish the fire and prevent further spread. There is currently a Fire Investigation Team on route to confirm the source of the fire". Posting on Facebook, St Austell Community Fire Station later confirmed the cause was accidental. The fire was in the building known as “The Old Market House” which is Grade II listed and build in 1840-50, extended in 1881 (datestone). It has now been converted to flats. 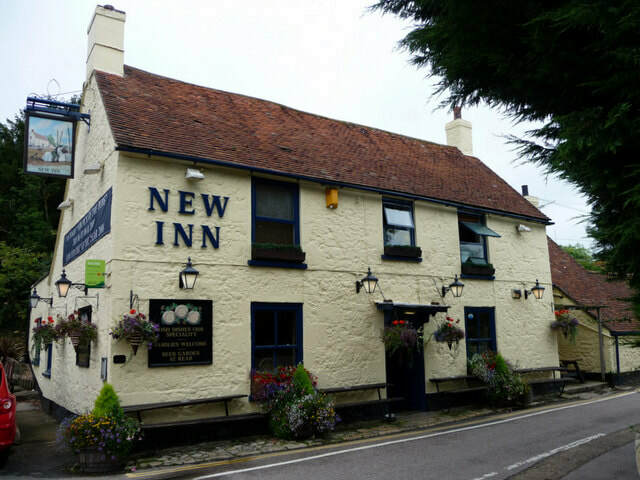 A small chimney fire has been tackled at The New Inn in Shalfleet today (Tuesday). Newport’s wholetime appliance was mobilised to the village at just before 11:00 this morning following reports of a chimney fire. The crew promptly arrived on scene and used a variety of specialist tools to fully extinguish the fire. 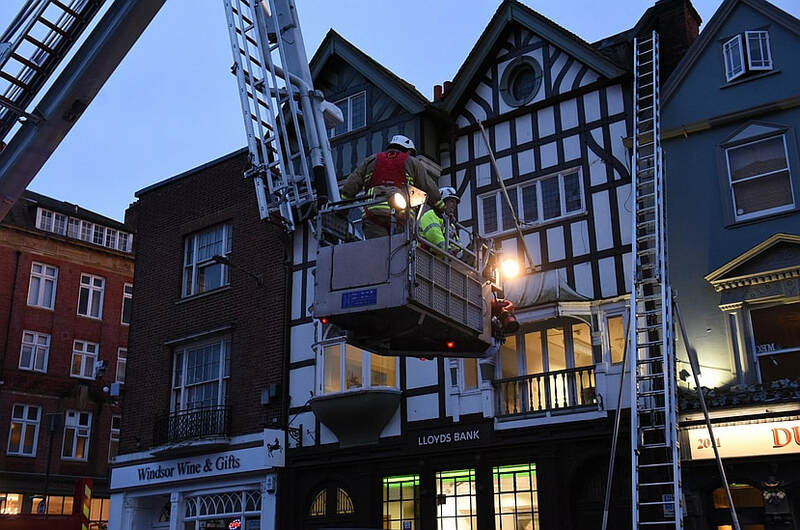 Firefighters were on scene for almost 2 hours as a full inspection of the pub’s loft was carried out to ensure the fire had not spread. They left the scene at 12:49. 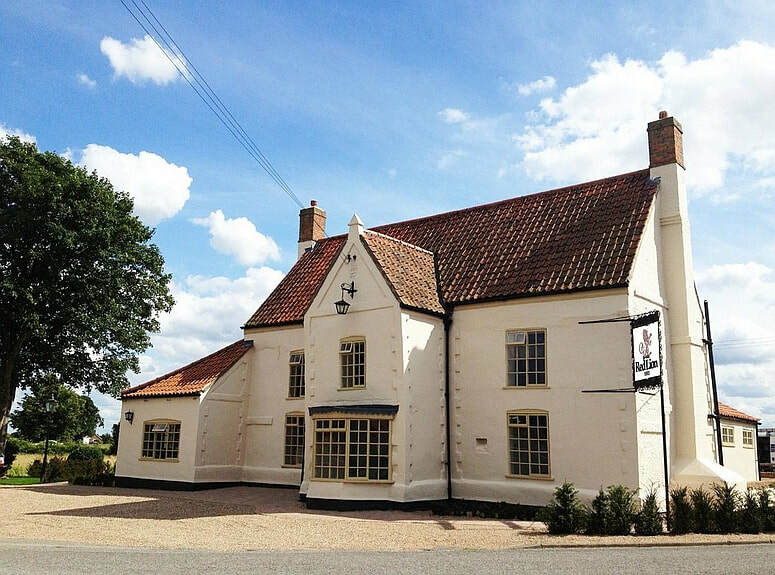 The Inn is a Grade II listed building and started life as a "church house" belonging to the nearby church. 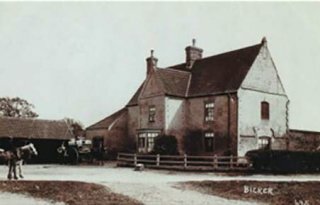 In 1734 much of the building was destroyed by fire and was rebuilt as a "new" inn. A lease of 1744 still survives by which John Perkins of Wellow agreed to erect at his own expense on the site of the old church house "a house with walls of brick or stone, of 2 storeys high, the ground storey to be eight foot high and the other storey seven foot to-the plate". Kelly's Directory records that in 1881 the landlady was a widow from Southampton called Emma Shotter who shared the pub with her children Clement and Selina. 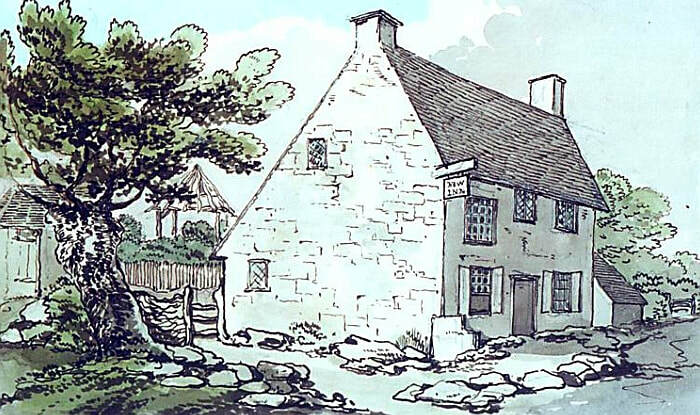 For a time, beer for the pub was brewed in the big stone house opposite known as The Maltsters. Parts of the original "church house" can still be seen in the public bar. Investigations are continuing after a second fire in two days at a derelict builder's yard in Skegness, next to the former Victorian Church. - and another just an hour later on an industrial estate in the town.- Lincolnshire Fire and Rescue this morning reported 'a busy night on the East Coast' after crews from Skegness and Wainfleet were scrambled to the blaze on Roman Bank - and then called to another derelict building on Heath Road. One resident Barry Robinson said: "This is two nights running that there has been a fire here. There's a derelict church on the corner of Roman Bank. It's shocking that it's happening so often. There are rumours flying around about what is happening." 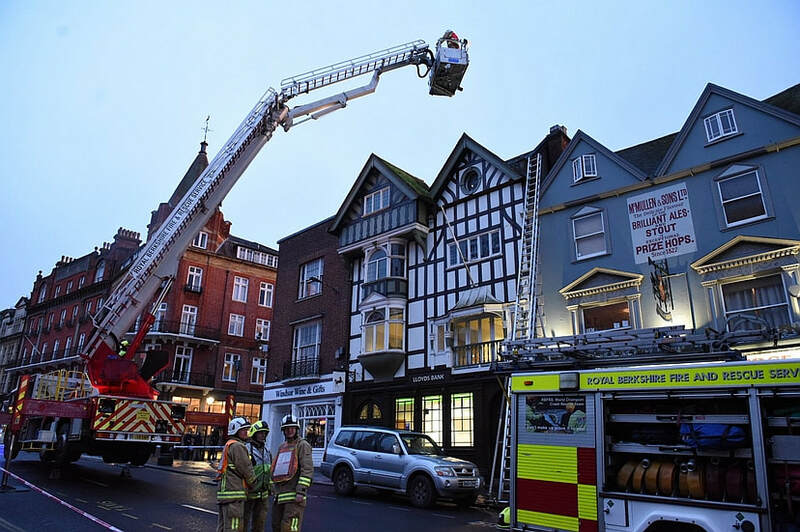 Firefighters raced to the Duchess of Cambridge pub in Thames Street, Windsor at 4.10pm this afternoon after receiving reports of a fire. 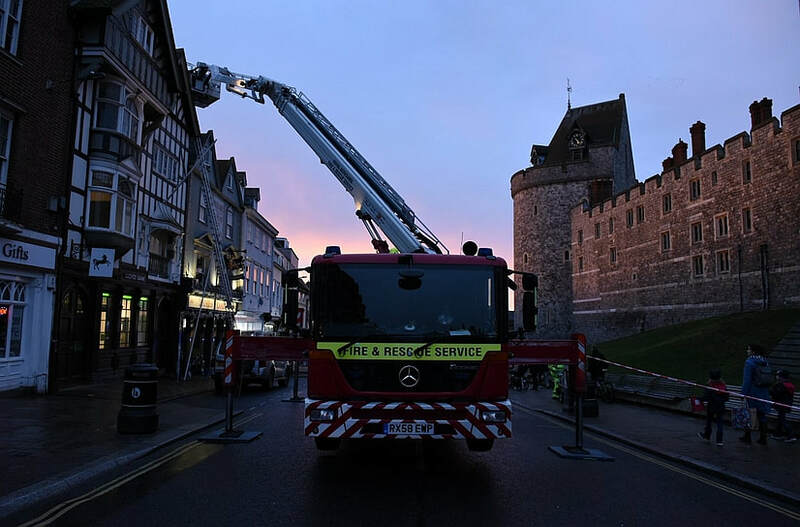 Royal Berkshire Fire and Rescue (RBFRS) crews from Windsor, Ascot, two crews from Slough and the Aerial Ladder Platform (ALP) from Whitley Wood Fire Station were sent to the scene, which is right in the shadow of Windsor Castle. They found a fire in the chimney of the building and the road was closed while they tackled it. The road has been closed off. But a staff member said that the fire had been contained and it was hoped the premises could open as usual tonight. The Chimney that was involved in the fire lies almost between the pub and the Grade II listed Lloyds Bank next door. The Duchess of Cambridge pub is Grade II listed and dates from the 17th century, with alterations in the 19th century. Its listing describes it as part of an important group of consecutive listed buildings on the road. The pub has had several names. 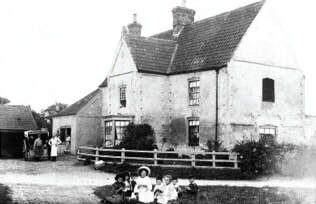 It was The Grapes Public House in the 1910s and 1920s. When it was listed in 1975, it was the Knights Tavern. It was Bar & Kitchen until 2011, when, following refurbishment it became the Duchess of Cambridge on the 21st June 2011. 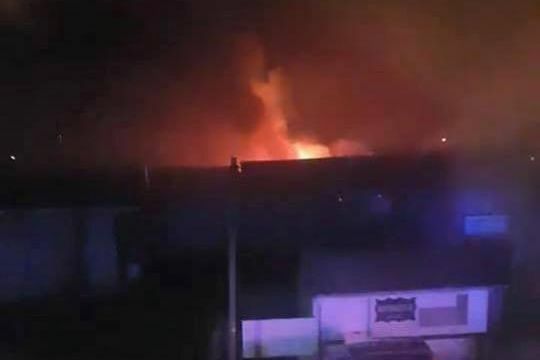 Police have confirmed that the fire at a derelict builder's yard in Skegness was 'deliberate' Fifty per cent of the ground floor area of the building on Roman Bank and its contents were destroyed in the blaze, which was reported to Lincolnshire Fire and Rescue at 7:19pm last night (Sunday). Today, police issued the following statement: "At 7.26pm on February 17 we received a report of a fire at premises in Roman Bank. We believe this was a deliberate act.."
Four fire crews from Skegness, Wainfleet, Boston and Spilsby were scrambled to the scene next to the former Primative Methoidist Chapel. Roads around the blaze were closed and residents asked to close their windows and doors and stay away from area. The fire was extinguished using two hose reel jets, two main jets, an aerial ladder platform from Boston and thermal imaging cameras. There were no injuries. Police are appealing for witnesses. Anyone who may have seen someone acting suspiciously in the area at around 7.25pm can contact police on 101, quoting incident number 324 of Feb 17. 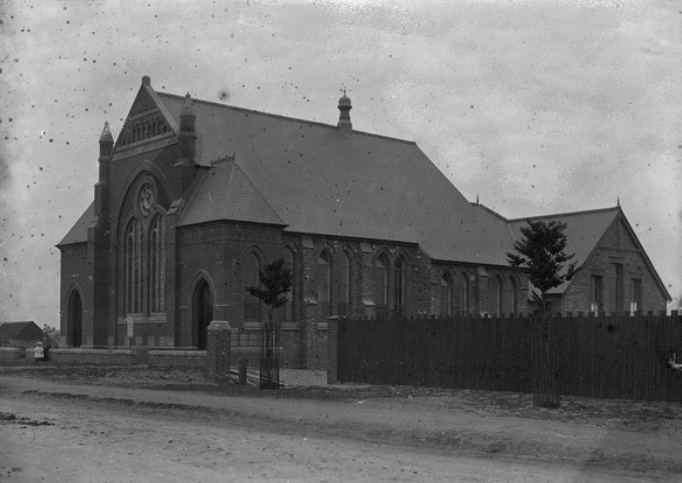 The former Victorian chapel, standing just a few metres away from the building set on fire, was built in 1899. It replaced an older chapel across the road, which was subsequently converted to three houses. It closed as a Chapel in 1979, and since then has been used as a second hand furniture store (see Building History below). Fire at the derelict builder’s merchant building on Roman Bank, Skegness. Seven years later the present organ was installed, the opening being fixed for May 13th, 1906. Shortly after this the Skegness Circuit was formed, with the Roman Bank Church as its head. With the coming of Methodist Union in September,, 1932, the local Primitive Methodists proudly took their stand with other sections of Methodism, that there might be formed the great Methodist Church. Circuit Amalgamations followed in 1933, when the ex-Wesleyan Skegness and Wainfleet Circuit, the ex-Primitive Methodist Skegness Circuit, and the ex-Primitive Methodist Leake circuit joined hands to form the present Skegness and Wainfleet Methodist Circuit, the Roman Bank Church occupying second place on the Circuit Plan. The year 1979 saw a far-reaching change for Methodism in Skegness. As a result of Roman Bank's financial difficulties, as well as the recommendations of the District Redevelopment Committee, it was decided that Roman Bank and Algitha Road Methodist Churches should amalgamate and should use the latter church's premises. On Sunday morning 23rd September 1979 the actual union of the two congregations and Sunday Schools took place. There was first a united service at Roman Bank, conducted by the Chairman of the District the Rev. W. Eric Jones and then all joined in a procession to Algitha Road where a Communion service was held. 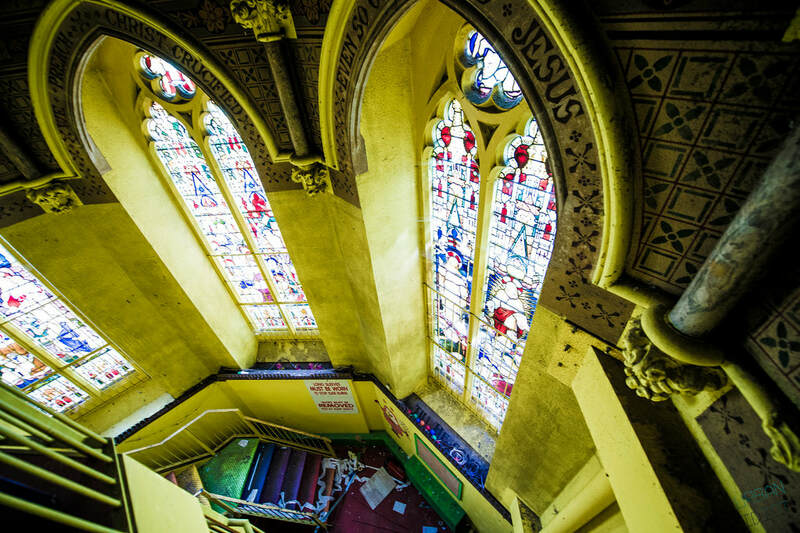 Following its closure as a chapel in 1979, it became a second hand goods store called ‘Ye Old Church’. It later became "Old Church Home Furnishings" which closed sometime between 2009 and 2014. The building has been vacant since then. Roman Bank Primitive Methodist Chapel in 1900, soon after it was built. 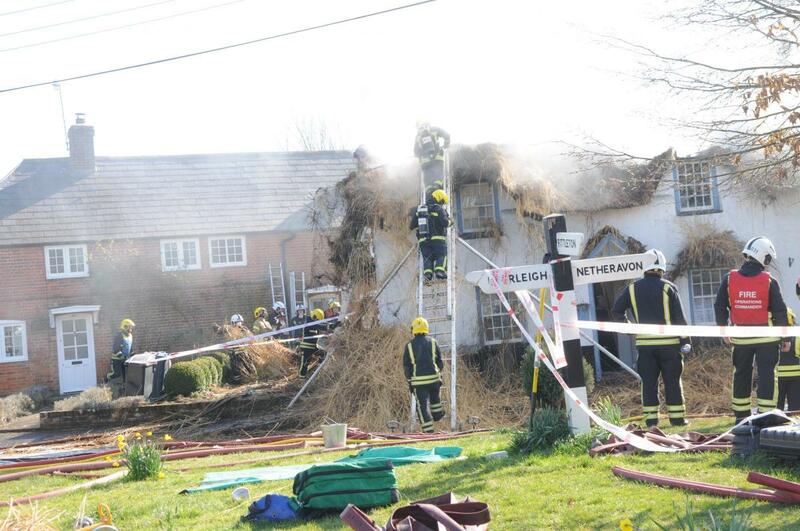 A fire has caused extensive damage to the popular 17th century Grade II listed Ye Olde Red Lion pub in Bicker today. Crews from Donington, Billingborough and Boston were called to the pub, in Donington Road, Bicker, just before 11.10am. Two water hose reels, four thermal imaging cameras, six extinguishers and a fan were used to tackle the fire and clear smoke. However, the incident damaged a utility area and its contents, floorboards in a bathroom and left smoke damage to the whole building. A statement posted by pub managers on social media said: "Due to an electrical fault and fire, we are having to close this weekend. The emergency services have been fantastic and the main thing is that no one was injured. However, the damage to the background floor is a little worse than we thought." This white-painted inn had the name “John Drury” around the year 1665 (the date of the Great Plague of London) and it is understood that this was the date it was restored, and therefore existed some time before this. Inside, the rooms recapture the atmosphere of a typical English inn, with low beams and paintings of blood sport around the walls. Local tradition says that the pub was once called “ Mariner’s Rest”, and the “Sailors Rest”. The local belief that Bicker Haven was once an inlet of the Wash, and that the Red Lion was once a lighthouse, has no known historical basis other than its position beside the river, by then already reduced to a trickle. 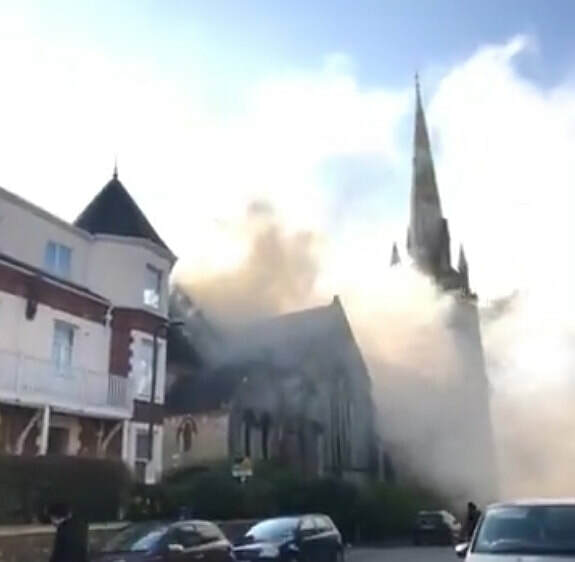 More than 40 firefighters are currently on the scene in Torquay after a fire broke out at an abandoned church - and they are expected to be there through the night. Devon and Somerset Fire Service received 20 calls from members of the public following reports of the fire which started at 2pm. A total of seven fire engines from Newton Abbot, Paignton, Teignmouth and Newton Abbot along with a command support vehicle from Totnes and an aerial ladder platform from Danes Castle are currently fighting a large fire involving the derelict building locally known as Rainbow Fun House building. It is currently unknown whether any people are inside the building but the fire is involving the first floor and the roof space. Residents nearby are also being advised to stay indoors and to keep their windows shut. Constructed in 1894 by J Watson, as the Church of the Holy Trinity and is a Grade II listed building. It was built on the site of an earlier chapel. The gate piers and wall is also separately Grade II listed. The stained glass of the West window is by Drake & Son, designed by Maurice Drake, and completed in 1907. It is notable for its corner pinnacles with flying buttresses. It had been owned by Alan Wood since 1982. It was formerly the Breakaway Sports Centre and Sports Club and he developed it into the Rainbow Fun House, a children’s soft play area, which opened in February 2001. 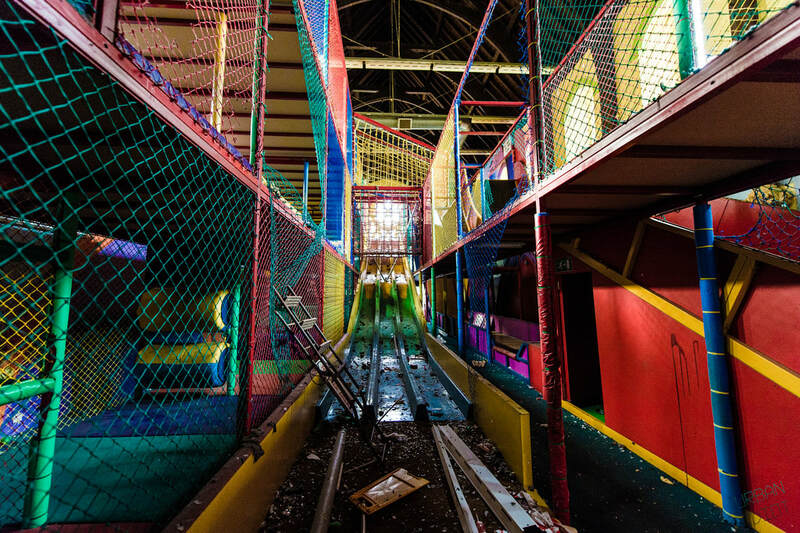 In 2010, The Fun House failed to sell at auction on the retirement of Mr. Wood with a guide price of £600,000. It finally closed in 2015 and went to auction again but this time with a guide price of £215,000. Since then, the building has been boarded up. In 2017, a group moved into the former church and said that they hoped to claim squatters rights to create a community space. But they were evicted and the property became further boarded up and fenced off. 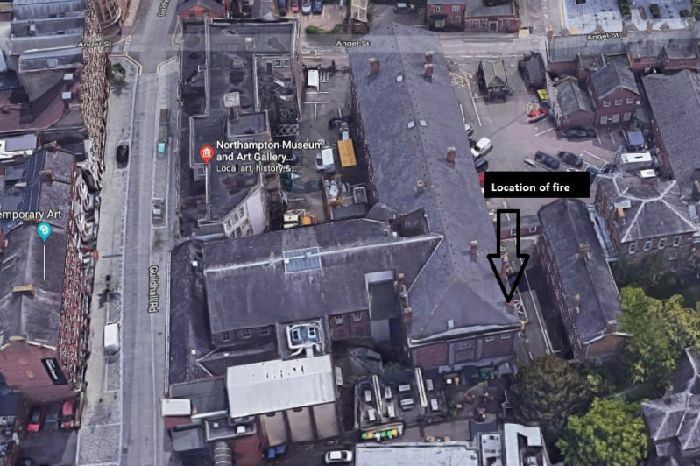 A fire has broken out in a museum that is currently closed for refurbishment. 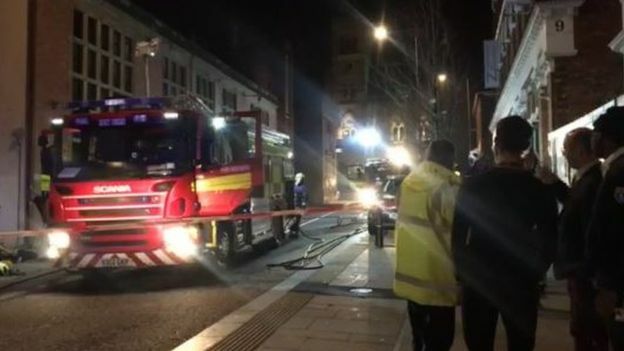 Emergency services were called to Northampton Museum and Art Gallery after smoke was seen coming from the property, in Guildhall Road, at 19:40 GMT. 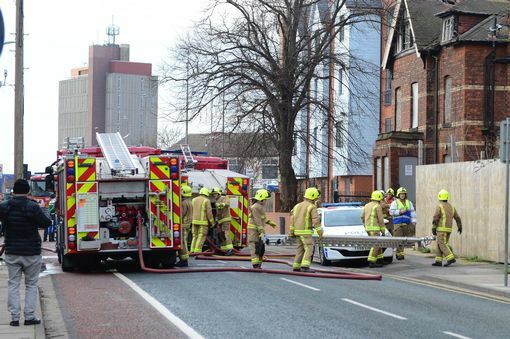 Fire crews forced their way into the building to tackle the second-floor blaze, which it said "involved debris and had travelled through the floor". Northampton Fire & Rescue Service is advising motorists to avoid the area due to road closures. Residents are also being told to keep windows and doors closed. The museum closed in February 2017 for a "major new expansion project". It is hoped work will be completed by spring 2020. Update 14 February 2019 - Northampton Borough Council said this morning that the authority still needs to carry out a full assessment but damage looks relatively minor at this stage. Northampton Borough Council leader, councillor Jonathan Nunn, said: “We're extremely grateful to Northamptonshire Fire and Rescue for their quick response, and to whoever called the incident in to the Fire Control Room.” The local authority is also awaiting the result of the fire investigation regarding cause and have said more updates will be offered as they become available.The fire was on the fourth floor in the north-west corner of the Georgian "Old Gaol Block". It is not understood to be an area that will be accessible to the public once the renovations of the complex are complete. 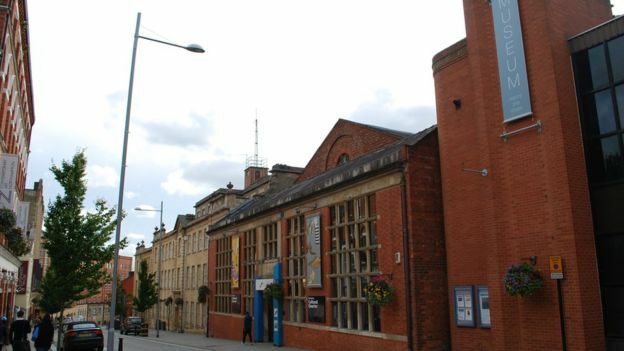 The museum and the Old Gaol Block both lie within the Derngate Conservation Area. The first phase of the £6.7m museum refurbishment project is being funded entirely through proceeds generated from the controversial sale of the 4,000 year old Sekhemka statue, which was sold to a private collector for £16m in 2014. The project will add an extension into the former Georgian Gaol Block on Angel Street, which was initially part of the museum until being sold off and became a Salvation Army barracks with mineral water factory in the basement. The council has now bought back the Old Gaol building. The reclaimed space will house a shoe gallery to showcase the museum’s collection. The location of the gallery allows it to flow into parts of the vaulted structures which formed the original Gaol, more than doubling the amount of public space. The council has appointed contractor Wildgoose Construction Limited for the expansion, which will include new galleries, a cafe and educational spaces. The new shoe gallery will highlight Northampton's links with the industry and featuring items including Prince Albert's boots and Queen Victoria's wedding shoes. 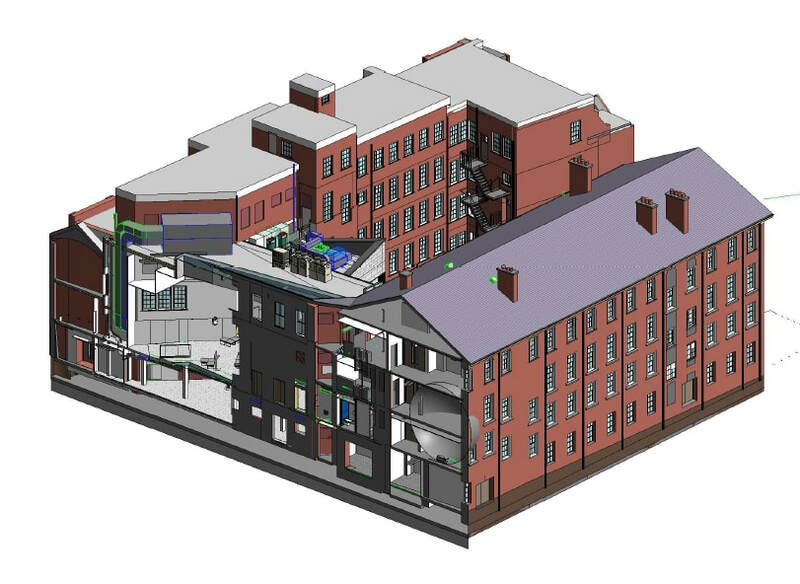 Despite the complexity and issues presented by three historic buildings and joining these together with a new-build element, Wildgoose has confirmed it can deliver the whole project within budget by spring 2020. The fire service said the blaze, on the second floor of the museum, involved "debris"
The museum collections include archaeology and fine art, as well as covering social and military history. “Every prison be white-washed at least once every year, and that this be done twice in prisons which are much crowded. That a pump and plentiful supply of water be provided, and that every part of the prison be kept as clean as possible. That every prison be supplied with a warm and cold bath, or commodious bathing tubs, and that the prisoners be indulged in the use of such baths, with a proper allowance of soap and the use of towels. That attention be paid to the sewers in order to render them as little offensive as possible. That great care be taken, that as perfect a separation as possible be made of the following classes of prisoners. That felons be kept entirely separate from debtors; men from women’ old offenders from young beginners; convicts from those who have not yet been tried. That all prisoners, except debtors be clothed on their admission with a prison uniform and that their own clothes be returned to them when they are brought to trial or are dismissed. The gaol had room for 120 prisoners. The 17th century gaol was converted into a turnkey’s lodge with a day-room for debtors on the ground floor and a grand-Jury room on the first floor. The current museum building is part of a gaol block that was opened in 1846 with capacity for 150 inmates. It comprised two galleried wings with single-occupant cells arranged along the walls at four floors. Legislative changes rendered the gaol redundant and the east wing was converted for use as a library, public reading room and a museum. A fire in a light fitting caused a flat in Manningham's Lister Mill to be filled with smoke this afternoon. Fire crews had to break into the unoccupied apartment at 4pm after the alarm was set off by smoke from the overheating light fitting. Firefighters wearing breathing apparatus made sure the fire was extinguished after breaking into the home in the Silk Mill part of the complex. The flat and surrounding corridor was then vented to clear the smoke. Crews from Fairweather Green and Shipley attended the incident. The vast Listers Mills complex is Grade II* listed. Built in 1871, it was converted into flats in 2006 (see Building History below). If you had to describe the Listers Mills complex in Manningham in one word, it would be ‘monumental’! Lister's Mill (otherwise known as Manningham Mills), was founded in 1838 by Samuel Cunliffe Lister, The business eventually made Lister one of Bradford's most famous fathers, a multi-millionaire and the provider of thousands of jobs in the city. Lister's Mill changed the identity of the region, its skyline and its economy. Lister himself epitomised Victorian enterprise; and he worked on a grand scale. Disaster struck in 1871 when a fire destroyed much of the earlier mill and claimed the lives of two workers. Undeterred, Lister had a new mill complex rise phoenix-like from the ashes. When the new Manningham Mills opened, they were the largest and most imposing textile building in the north of England. Two vast multi-storey blocks dominate the site, one a spinning mill and the other used mainly as a warehouse. An imposing boundary wall creates a fortress of industry. They remain a dominant feature of the skyline, even today. Designed by local architects in an Italianate style and with a chimney reaching 249 feet into the air, inspired by the design of St Mark’s Campanile in Venice, the new buildings covered a vast area of 13 acres. The new mills were a fitting home for the Lister empire, which by 1871 had acquired several other mills in the north of England and a colliery (Manningham Mills alone used 50,000 tons of coal per year!). At its height, Lister's was the largest silk spinning and weaving mill in Great Britain and employed over 11,000 people. It was a major exporter, with two thirds of all its production going overseas. Lister built the largest silk factory in Europe and was the most important textile inventor of his time. Although he was known as the 'King of Velvet', his business was diverse, and over the many years it traded, produced an enormous range of fabrics. Crepes and chiffons were produced for ladies' fashions; military uniform and parachute fabrics were made during the wars and synthetic fabrics such as Crimplene and Terylene were manufactured. As early as 1889, Lister had become world famous for the production of silks, imitation sealskin and mohair plush, although he was probably best known for his velvets. The company supplied more than 1,000 yards to Westminster Abbey for the Coronation of George V in 1911, and as late as 1976 supplied the velvet for the curtains in the White House in Washington. During WW2 Listers produced 1,330 miles (2,140 km) of real parachute silk, 284 miles (457 km) of flame-proof wool, 50 miles (80 km) of khaki battledress and 4,430 miles (7,130 km) of parachute cord. After decades of decline in the post-war period Lister and Company went into administration in 1997. Lister Mills fell into dereliction and were included on the first Buildings at Risk Register in 1998. Urban Splash, a development company with a track record of converting iconic buildings to new uses, took on the site in 2004. After extensive repairs, two multi-storey blocks are no longer at risk and they now house over 300 apartments as well as commercial and community uses. The addition of bold roof-level pods show how creative interventions can open exciting new chapters for historic buildings. The next stage of regeneration includes urgent repairs to parts of the perimeter wall, which Historic England hopes to support with funding. 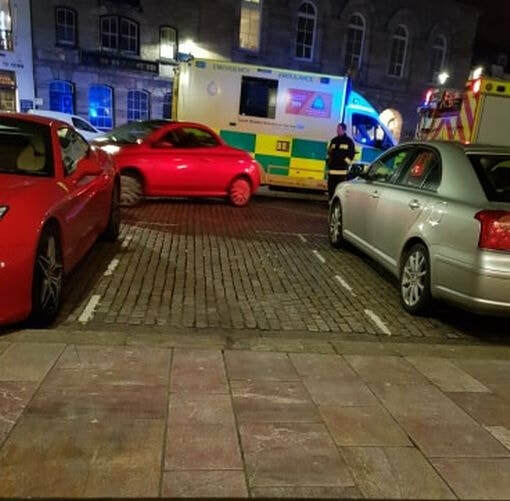 12 February 2019 (20:00*) - Fire crews and ambulance called to the Maritime Inn at the Barbican. Emergency services have rushed to the Barbican in Plymouth following reports of a fire. The fire service and paramedics have been seen outside the Grade II listed Maritime Inn on Southside Street. An eyewitness said they saw crews arrive on scene just after 8pm. 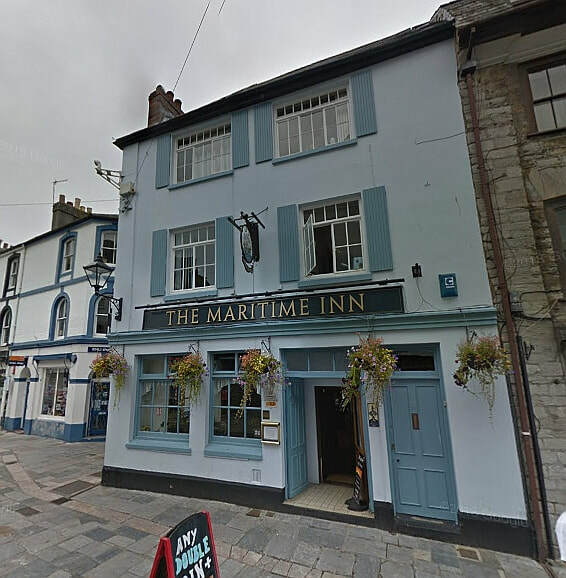 The Maritime Inn lies within the Barbican Conservation Area. The Grade II listed Maritime Inn on Southside Street. 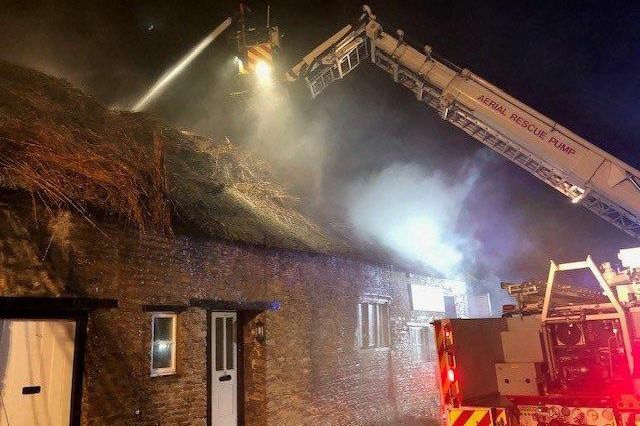 Fire crews from across the county were battling to save a much-loved village shop tonight after it caught fire tonight. 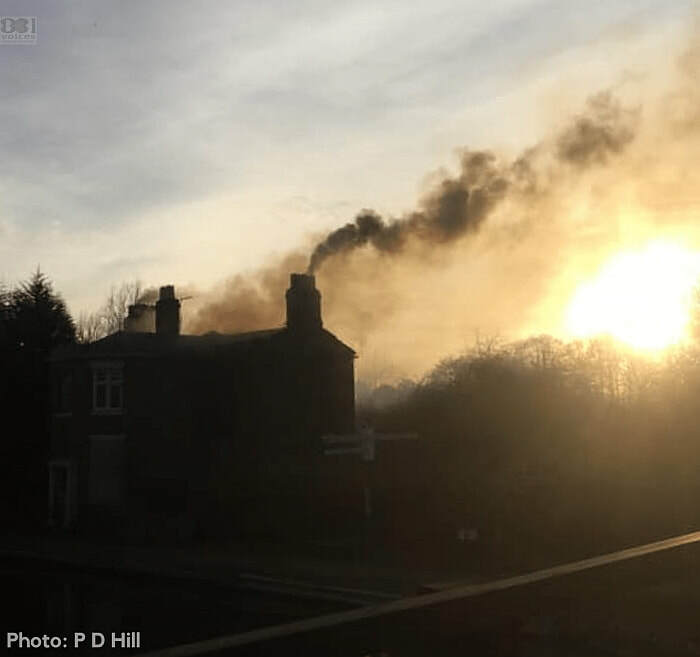 Firefighters were called to The Bulwick Village Shop, home to The Pickled Village, at about 6.30pm tonight after flames were spotted. The shop was founded in 2005 by Camille Ortega McLean who took on the former post office and renovated it. Now, a huge range of home-made and locally-produced food and drink is sold from the shop which attracts custom from across the county and beyond. It has also won many awards. Prospective Parliamentary Candidate for Corby and East Northants Beth Miller also passed on her well wishes to the shop and said she was thinking of the owners. Firefighters are tackling a flat fire on Union Street in Ryde this evening (Tuesday). One appliance is currently on scene with firefighters commited to the property above iFix Local. Residents have been evacuated and the area cordoned off. Other appliances are struggling to reach the scene due to a number of vehicles stuck in the one-way system. Union Street is currently closed to all traffic. The alarm was raised at 5.45pm, and by 7.25pm the fire in the kitchen had been successfully extinguished and crews had left the scene. No one has been injured as a result of the fire. The building is Grade II listed and was built in about 1840. This part of Ryde has a very high density of listed buildings and lies within the Ryde Conservation Area. A building on Grimsby's Eleanor Street is on fire again this afternoon. Humberside Fire and Rescue crews are battling the blaze at the constantly targeted buildings. 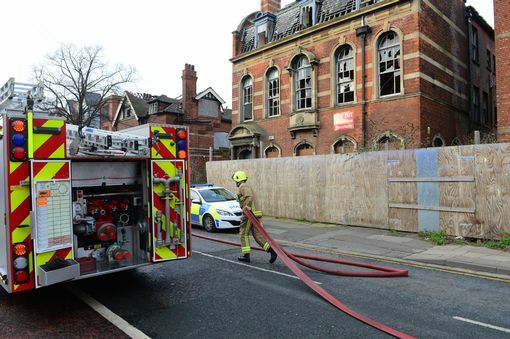 At least four crews from Humberside Fire and Rescue's green watch are currently battling the blaze.The former education offices, which are due to be converted into flats and shops in the future, along with neighbouring buildings, is a regular target for arsonists. The group of late Victorian and Edwardian buildings, which lie in the Holme Hill Conservation Area - The College of Art and Design (Grade II listed), built as the Wintringham Higher Grade School in 1894, School Board Offices, (Grade II listed), built in 1900-01, and Farnhurst, a private house built in 1893, (the home of Thomas W J Allen (surgeon) in 1909 and Locally listed), later a care home - are some of the most dilapidated in Grimsby. A Humberside Fire and Rescue service spokeswoman said a call was received at 2.58pm and crews arrived at 3.06pm. Humberside Police have also been called to help direct traffic around the busy road while the incident is dealt with. Eleanor Street is closed between Hainton Avenue and Heneage Road. A cordon has been put in place as there are fears the fire may spread throughout the building. Eleanor Street is now the town's number one arson hotspot. 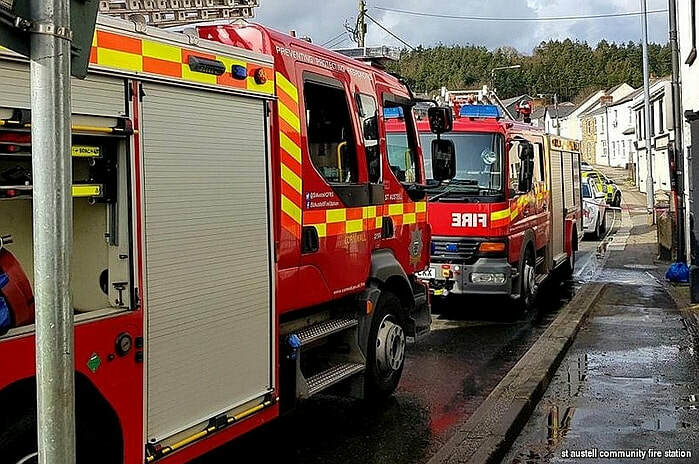 There have been at least 42 deliberate attacks on the historic buildings in the past five years, with at least 14 fire call outs during 2018. 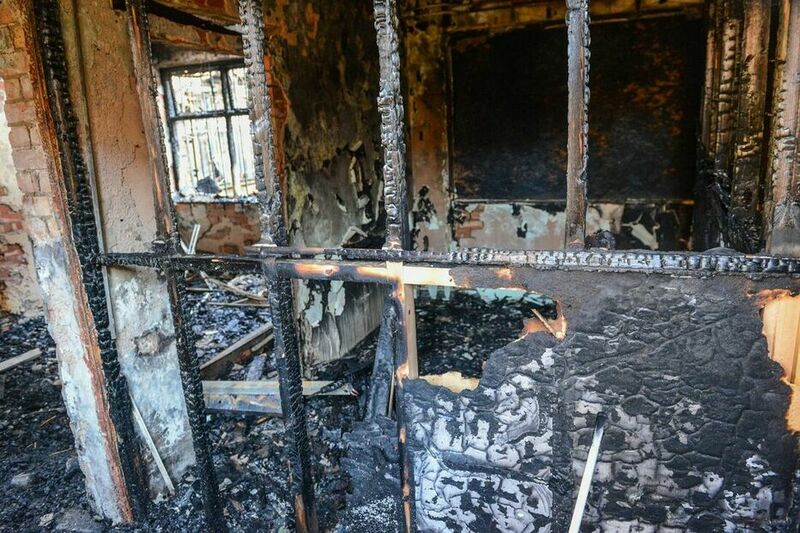 Official statistics, uncovered as part of the Stop the Rot campaign, show how expensive security and monitoring by emergency services failed to deter a quadrupling in arson call outs since 2013. A bystander said: “This happens all the time, why is nothing being done about this building.” Passers-by are also discussing the history of the building at the corner, wondering when it was shut down as they learned to swim there. Another passerby said that people have been accessing the building through a hole in the fence at the rear of Boyes car park. The site is said to be full of fly-tipped rubbish. 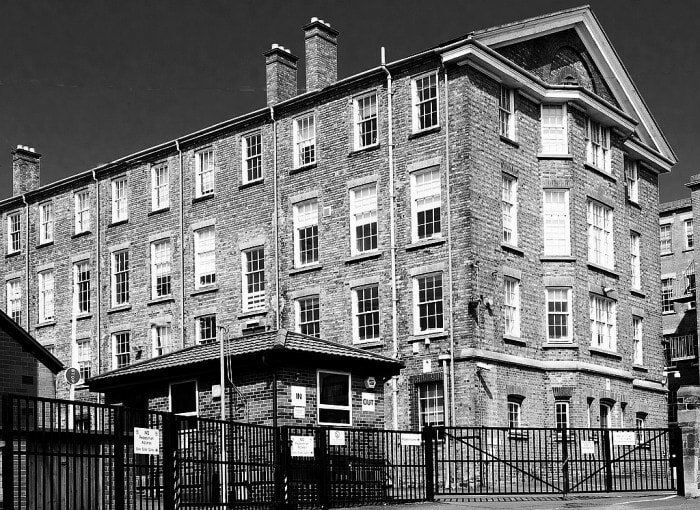 Back in October 2018, a war of words broke out as the battle to save the historic Eleanor Street complex intensified. The company hoping to salvage the rotting Education Offices and Art College said it had now exhausted all options to save them. 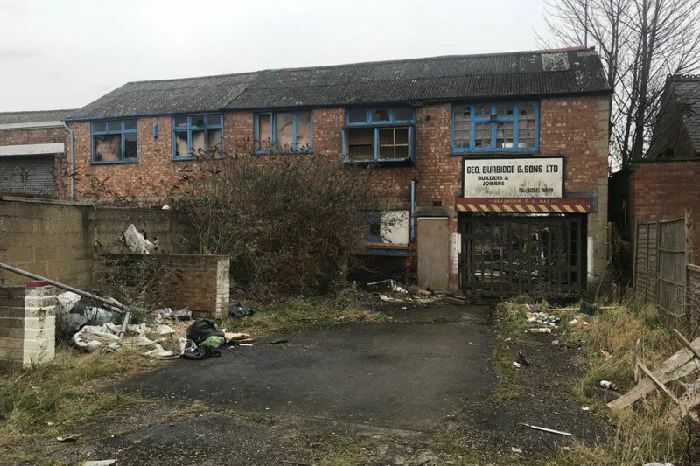 East Marsh Regeneration (EMR) blamed council delays and the authority's perceived lack of support for the perilous dereliction of the buildings. But North East Lincolnshire Council hit back - warning the company that the authority could use legal powers to protect the buildings. EMR submitted a 90-apartment redevelopment plan to the council's planning department 12 months ago. Eight months later, and planners were still to give their verdict, leaving the company in limbo and the historic complex on the verge of complete dilapidation. 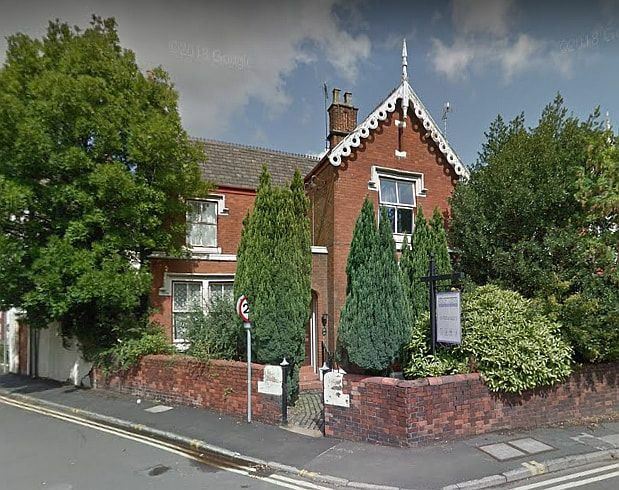 Consultant Gareth Gerner confirmed the plan, which would see a large section of the buildings demolished, is now stalled until the council makes a decision or helps to unlock grant funding for an alternative proposal. He said: "We believe we have done everything in our power to stop this situation, but until the council grants permission or agrees a solution to bridge the market gap, there is no more we can do. So we continue to make proposals to the council and wait on the council officers to accept one of these proposals or come up with alternatives, to ensure that this much needed community scheme is delivered together." There have also been objections from Historic England to the plans which have caused delays, so EMR is working to find a proposal that saves more of the buildings. But Mr Gerner said the financial context is "very challenging" and the private sector alone cannot make it viable in the current market. A North East Lincolnshire Council spokeswoman said funding sources are available to potentially bridge the viability gap. But she said EMR had provided insufficient detail in its business case and the company would need to take the lead in securing any funding. Issuing a warning to the firm, she said: "It is important to note that as owners of the buildings, the company have a legal responsibility to stop the buildings falling into a dangerous condition. Should they fail to do so; the council could be required to exercise its legal powers." So, whilst N.E. 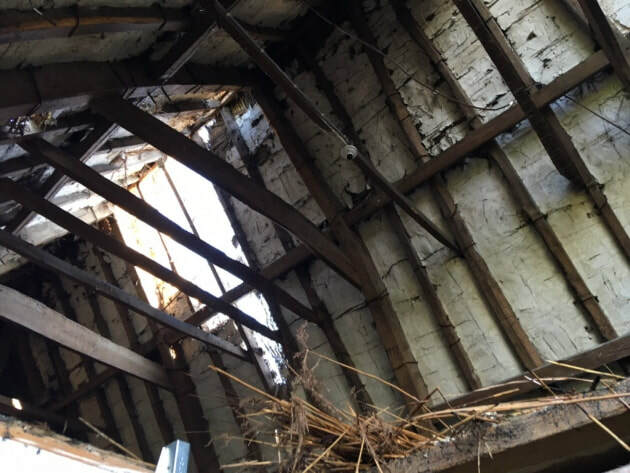 Lincolnshire Council, EMR and Historic England argue over who is to blame, the buildings have reached a critical stage and are falling into a dangerous condition. Decades of neglect since their closures in the 1990s, have caused a massive downturn from their glory days and these once proud buildings are now fenced off with signs warning of danger. Soon they will have been damaged beyond economical repair and there will be no option but to demolish them. 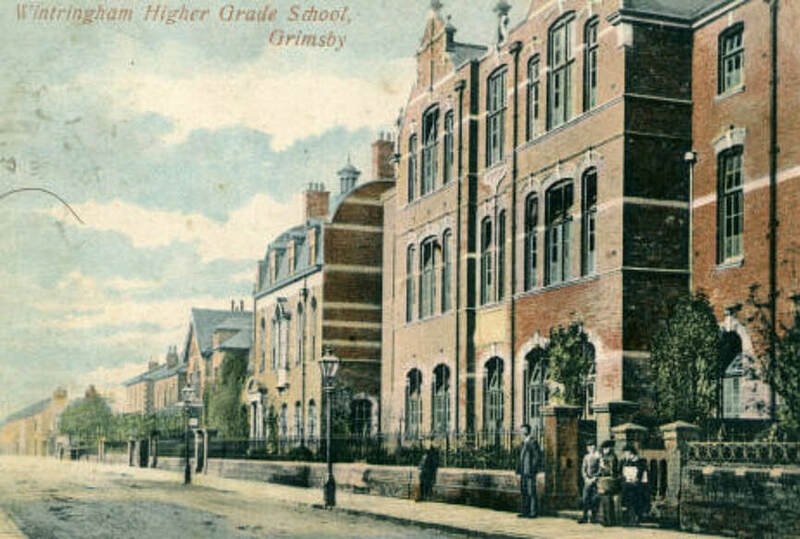 The Grimsby College of Art and Design, and the next door School Board Offices, have been included on the Victorian Society’s list of the ten most endangered Victorian and Edwardian buildings in England and Wales. A 1920s postcard showing the three buildings in their glory days.